Zakar Boyajyan joined Gazelle Finance in July of 2014 as the Chief Investment Officer for Armenia. Zakar brings 22 years of finance, banking, risk management, and structured finance experience. Zakar works for Unibank, one of the leading banks in the region as the First Deputy Executive Director, Chief Risk Officer, and a member of the Credit Committee. At Unibank Zakar manages a $260M loan portfolio with less than 4% default rate and oversees 65 individuals. He is also responsible for establishing the bank’s operating procedures and risk management policies. Prior to Unibank, Zakar worked as the Executive Director at Izmirlyan-Eurasia Universal Credit Company,where he managed a $25M loan portfolio without a single default. Prior to Izmirlyan-Eurasia, Zakar served as the Country Director of the $10.5M Small Business Loan Program at Eurasia Foundation, where he had a successful lending track record of financing companies in every region of Armenia, achieving less than a 2% default rate over a ten-year period. 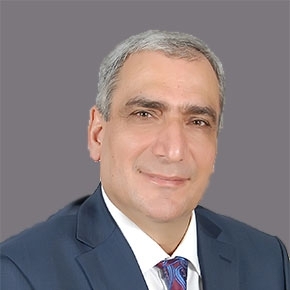 Zakar is highly experienced in both origination, risk and portfolio management, and is respected in the banking industry for his skill and successful track record of managing the default and collection processes according to the Armenian legal system. Zakar also served on various positions at the Ministry of Finance and the Central Bank of Armenia and is a frequent lecturer with the leading universities in Armenia. Zakar holds an MBA degree from the American University of Armenia and a bachelor's degree in economics from the National Institute of Economics in Yerevan. He is fluent in Armenian, English, and Russian. Zakar has investment experience in following market segments: SMEs, agribusiness, retail, and financial services. Rifat Utiushev joined Gazelle Finance in July 2014 and served as its Chief Investment Officer for Kyrgyzstan until the end of 2016. Currently Rifat serves in the capacity of the independent Investment Committee member until such time that Gazelle launces investment activities in Kyrgyzstan. Rifat has over 20 years of professional experience in corporate finance, banking, and private equity. Prior to joining Gazelle, Rifat served as the Chief Financial Officer of the $300M Development Fund of the Kyrgyz Republic, where he managed over 20 people. Prior to joining the Development Fund he co-founded and served as the Chief Financial Officer of Yuzno-Kyrgyzskiy Cement company, based in the southern Kyrgyz regional center of Osh, where he raised and structured $110M of international financing from China Export-Import Bank, Kazakh BTA-bank and Investment Fund of Kazakhstan. Rifat led the sale of the company to an international investment fund successfully achieving the return expectations of his shareholders. Rifat also worked for the European Bank for Reconstruction and Development (EBRD) for 7 years, where he financed various projects in tourism, manufacturing, and other industries, including one of first equity investments by EBRD in real estate and construction materials in Kyrgyzstan. Rifat holds an MBA degree from Bishkek International School of Business and Management. He is fluent in Russian, English, Kyrgyz and Uzbek. He serves on the board of BTA-Bank in Kyrgyzstan. Rifat has investment experience in following market segments: tourism, manufacturing, real estate, and retail. Arman Hakobyan joined Gazelle Finance in November 2018 as an Investment Officer in Yerevan, Armenia. Arman brings 9 years of corporate and SME lending experience working with Pan-Armenian Development Bank and Ineco Bank, as well as 9 years of financial consulting experience at USAID and World bank funded projects focused on development of SME financing products, energy efficiency and student loan products. Prior to joining Gazelle Finance, Arman worked at Pan-Armenian Bank, taking increasingly responsible roles in lending operations of the bank specialized in long-term financing of export-oriented SME projects. He played a significant role in shaping and successful execution of project-based lending with result of more than $10 million portfolio of loans to 21 export-oriented enterprises. As a corporate banker Arman started his experience at Ineco Bank, in the division of Lending through International Loan Programs, including WB Enterprise Development Program, Shorebank SME Credit Program, SME Loan Program of Eurasia Foundation. He managed a high-quality loan portfolio of about $6.7 million with 30 SME clients. Arman holds an MBA with major in Finance from American University of Armenia and a Diploma of Economist with major in International Economic Relations from Yerevan State University. Arman is fluent in Armenia, English and Russian languages.